SMS Cyborg Hunter (USA/Europe) in 10:02.33 by Frenom. Cyborg Hunter. A Paladin, bounty hunter who is part man, part machine. The task at hand is to punch and kill cyborgs. 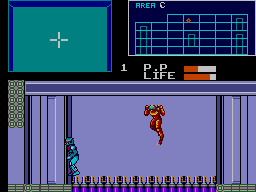 Running around within' the halls of the enemy base, which is a maze of connected sectors and floors linked by elevators. The screen is divided into three sections: map, close-up first-person view, and side-view, where the action takes place.